Sandnessjøen is a transportation hub for the entire region. 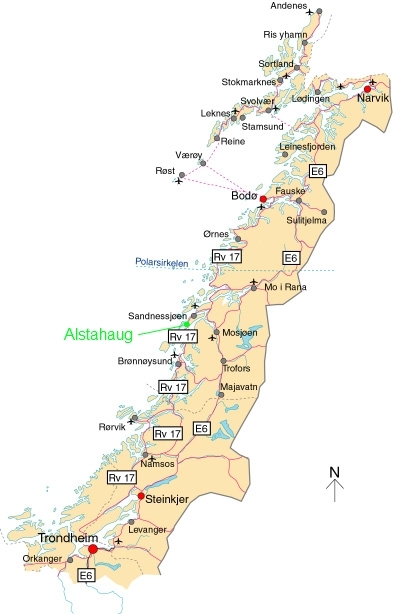 It´s situated next to the sea with daily access to ferry, flights to other Norwegian cities, express boat, scheduled buses and the Hurtigruten coastal steamer. A bridge connects Sandnessjøen to the mainland. From Sandnessjøen center there is approximatly 20 km to the museum, located at Alstahaug by the county road 17 (Fv17). Regular bus passes the museum twice daily. The easiest way to get there is still by your own car, bike or taxi. There are good bus connections between Sandnessjøen and Mosjøen. These correspond with the train. The nearest trainstation is in Mosjoen, approximately 70 km from Sandnessjøen. The northbound route arrives at Sandnessjøen every day at. 03:45 going further north at. 04.15.